A few years ago, I read the first two books in Pamela Belle’s Heron series, The Moon in the Water and The Chains of Fate. I loved them but because I didn’t have a copy of the third novel ready to start immediately, I never moved on with the series. The books have recently been reissued by Endeavour Press and I’m pleased to have finally had an opportunity to read the next Heron novel, Alathea (originally published in 1985). Alathea is the eldest daughter of Francis and Thomazine Heron, whose stories are told in the previous two novels. Although Francis and Thomazine do appear in this book, the focus is firmly on Alathea, which means it wouldn’t be absolutely necessary to have read the first two books before this one. I would still recommend starting at the beginning, though; I think you will get more out of the story if you understand Alathea’s family background and the relationships between the characters. The novel opens in 1660. Charles II has just been restored to the throne and thousands of Royalists exiled after the recent Civil War are on their way back to England – amongst them Simon Heron, whose return means that Alathea and her family must move out of the Herons’ Suffolk estate of Goldhayes and go back to Ashcott in Oxfordshire. It is there that Alathea meets a boy called John Wilmot for the first time – but it will be several years before their paths cross again. At the age of eleven, Alathea’s talent for drawing is becoming apparent, and she already has dreams of building a successful career for herself as an artist. Her dreams move a step closer to reality when her parents send Alathea to live with her Aunt Lucy in London in the hope of separating her from her jealous half-brother, Kit. Here Alathea has the opportunity to study with the famous female artist, Mary Beale, and as the years go by she begins to establish herself as a portrait painter. It is through her painting that Alathea is brought back into contact with John Wilmot, better known as the notorious Earl of Rochester. An attraction quickly forms between the two of them, but Rochester is not the only man interested in our heroine; Jasper, the son of Thomazine’s dearest friend, has decided Alathea is the woman he wants to marry, while Kit is also growing increasingly obsessed with his beautiful half-sister. Will any of them succeed? With Alathea reluctant to sacrifice her independence, she will need to find a way to reconcile her personal life with the career for which she has worked so hard. I’m actually glad that I waited a while before reading Alathea; I think if I’d read it straight after The Chains of Fate, I would have been disappointed that there wasn’t more of Thomazine and Francis, but allowing some time to pass meant that I was able to enjoy Alathea’s story in its own right. And it is an enjoyable story. Although there are some sad moments and some dramatic ones, there’s also plenty of humour (in particular, I’m thinking of a certain scene involving a dinner party and Rochester’s pet monkey). I’m sure Rochester must have been a fascinating character to write about; I’ve read about him once or twice before, but never in as much detail and never in a way that made him feel so human. There are some beautiful descriptions of the countryside surrounding Ashcott and Goldhayes, as well as of life in Restoration London – the section set during the Great Fire stood out for me as being particularly vivid. I also loved the way some of Rochester’s poetry is incorporated into the story, and the painting of his famous portrait, complete with monkey. What I found most interesting, though, was the portrayal of a young woman trying to make her own way in a male-dominated world, at a time when it was not at all common or very socially acceptable for a woman to earn a living as an artist. I didn’t like this book quite as much as The Moon in the Water and The Chains of Fate which I think was simply because I loved following the ups and downs of the romance between Thomazine and Francis, so was more emotionally invested in their story than I was in Alathea’s. 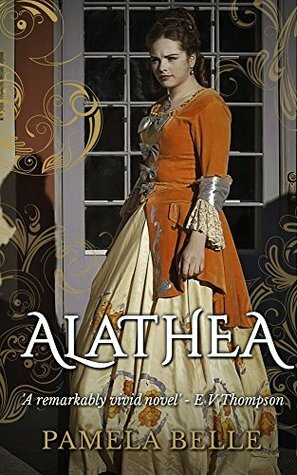 I still thought Alathea was a great book and I’m hoping to read Pamela Belle’s other series, Wintercombe, this year too. Thank you for that lovely review! Alathea was always one of my favourites – I look on it as my first ‘mature’ work (its predecessors were begun when I was only about fifteen or sixteen) and Rochester has always been one of my heroes – a really interesting man whose notorious exploits have tended to eclipse the deeper elements of his personality, and his poetry. I’m so glad you enjoyed it, and I hope you’ll also enjoy the Wintercombe series when you read them. Can I share this review on my Facebook page? Sounds good! For some reason I thought Endeavour Press reissues were all of really ancient books – out of copyright. Clearly I’ll have to pay more attention to them in future! Endeavour Press have been reissuing a good mixture of older and newer books. I’ve tried quite a few of their books since being auto-approved on NetGalley (which is fatal for the TBR!) and I think there’s a good reason why some of them had gone out of print, but others, like Pamela Belle’s, are excellent. These sound splendid. It’s great to hear they have been reissued. Yes, they are splendid – and it was lovely to discover that they were being made available again. “What I found most interesting, though, was the portrayal of a young woman trying to make her own way in a male-dominated world, at a time when it was not at all common or very socially acceptable for a woman to earn a living as an artist.” This is one of my favorite story themes.! Yes, it’s a theme I enjoy reading about too.